The most powerful Green Lantern of them all, Guy Gardner missed out on being Earth's first Green Lantern only because Abin Sur was in a hurry and he was farther away than Hal Jordan. He's headstrong and insists on doing things his own way, which is why he was the first Lantern to wear a distinct outfit, rather than the usual GL uniform - an outfit this Minimate duplicates. He gets a new chest cap for his fancy vest, a white and silver belt, and big chunky boots with buckles painted at the tops. Unlike Hal Jordan and John Stewart, Guy's ring gets an actual design, not just a spot of green paint. His orange Moe Howard haircut is a new piece, obviously, and he's got an interesting look on his face: one of artist Kevin Maguire's tricks for creating interesting faces is to draw the left and right halves of the face with different expressions, and that's what this Minimate displays. The particular combo comes right off the famous cover of Justice League #1. Guy includes the same lantern Hal had. Paired with Guy Gardner is the Green Lantern Corps' drill instructor, Kilowog. He's a big guy, so he uses the 2½" Minimate body as his base, then gets a "powerhouse" chest cap to make him even larger. He's wearing his modern Carlos Pacheco-designed costume, and his ring is the same new pattern as Guy's, up above. Since he's a larger figure, he gets a larger GL battery, too. His head is a unique piece, not the typical cylinder: it's molded with his tiny ears, distinct eyes and eyebrow ridges, and is larger around the base than at the top. It really would have been nice if we'd gotten some kind of ring constructs, even if they were only reused Street Fighter blasts - it would have really added a lot to the figures' coolness factor, and made for some really fun displays. 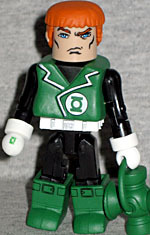 We only ever got four Green Lanterns before the DC Minimates fizzled out, and 50% of them are in this set. 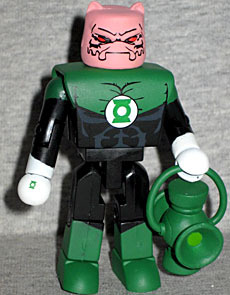 We can only imagine the big Blackest Night armies we'd have if DC Minimates had been as successful as Marvel, but Guy Gardner and Kilowog make for a good pair of figures. This entry was posted in Art Asylum, DC, MMMR and tagged Green Lantern. Bookmark the permalink. Four? I count 5-John Stewart, Guy 'n Kilowog, Hal and Salaak. Unless you weren't counting John Stewart because he was sort of from the Justice League line. Oh! No, I forgot Salaak!